The latest version of the 125 SX engine is once again the most competitive and powerful engine in its class. 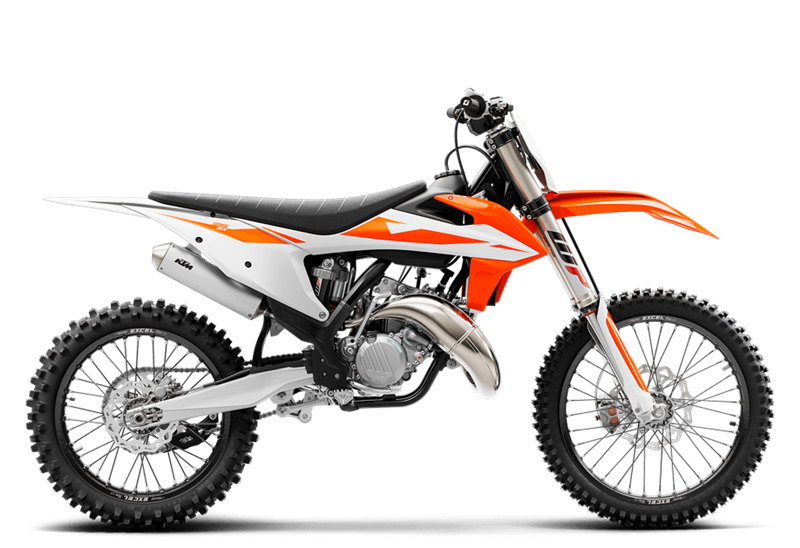 With an outstanding power-to-weight ratio, low cost and overall simplicity, it is clear that 2-strokes will continue to have a successful future at KTM. The compact and durable 17.2 kg engine was developed using the latest KTM engineering know-how, resulting in broad power across the rev range. Its easy rideability and outstanding performance are benefits that equate to faster lap times and better results. CYLINDER This compact cylinder with a 54mm bore features a cutting-edge power valve unit with a sophisticated mechanism for the lateral support exhaust ports. Matched to a twin-component cylinder head, it is KTM’s secret to all-round grunt. The layout of the water jackets in the cylinder and head guarantees efficient heat dissipation when the going gets tough. CRANKCASES AND ENGINE COVERS For the latest engine generation the KTM engineers designed lightweight die-cast engine cases featuring a high crankshaft position located close to the center of gravity, which results in optimal mass centralization and outstanding rideability. TRANSMISSION A robust 6-speed transmission was designed specifically for the small 2-stroke engine, its gear ratios are perfectly in sync with the 125’s power band. The latest production technologies allow for compact dimensions and minimal weight. An advanced ´No Dirt´gear lever design prevents mud from clogging the folding tip for reliable shifts even in the worst conditions. CARBURETOR The KTM 125 SX is fitted with a MIKUNI TMX carburetor. This 38mm flat slide carb lives to provide smooth and controllable power all the way up to the rev limitation. With a new intake manifold the carburetor is turned 7° in order to reduce the overflow of fuel. And it’s less sensitive to different altitudes and temperatures, so you can pin it wherever, whenever. IGNITION All 2-stroke models feature a new CDI control unit with an advanced hardware which improves the starting behavior of the engine. The ignition curves remain unchanged. EXHAUST The engineers meticulously tuned the resonator chamber for maximum torque and power, so this screamer is as tough as it is strong. To heighten the highly energized riding experience of a 125cc 2-stroke, KTM developed a new chassis that is light and responsive enough to enhance its dynamic reputation. For 2019, the KTM 125 SX features a new lightweight, high-tech steel frame that not only responds accurately to rider input, but has also been optimized for better rider feedback. The new flex characteristics help the bike to soak up those big hits while also delivering excellent agility and high-speed stability. As a whole, this new chassis allows the rider to be 100% in charge of the ride. FRAME The high-tech, lightweight chrome-moly steel frame has a knack for easy handling, outlandish rideability, precise cornering and excellent stability. You can also count on high torsional rigidity and low longitudinal stiffness. This results in better absorption of the energy created from the front and rear suspension, sucking up jumps and bumps. In short: more comfort and less rider fatigue. Laterally attached, engine head stays (the connection between cylinder head and frame) are now made of lightweight aluminum. They contribute to more precise cornering and a reduced vibration level. The engineers were able to pull off all that, while making their frame 2.2 pounds lighter than that of the lightest competitor on the market. In addition, it is easier to maintain, easier to work on and supplies more space for the tank and other components. The bike also features an extra-light subframe made of aluminum, which tiptoes the scales at less than 2 pounds. SWINGARM The cast aluminum design offers low weight and a perfect flex behavior. The single-component casting process eliminates any inconsistencies and inherent weak points created by welding. It’s better looking as well. WHEELS Featuring lightweight, CNC machined hubs and high-end Excel rims, they guarantee maximum stability and minimal unsprung weight. The wheels are shod with the latest Dunlop Geomax MX 3S tires. FRONT SUSPENSION The lightweight WP AER 48 front fork, a 48mm USD air-sprung fork developed by WP in close collaboration with KTM, is a split fork with separate functions for each leg. That means damping functions are on the right side, whereas the air spring is in the left. This left leg features a 2-chamber system with a capsuled air cartridge to prevent loss of air pressure. Should the outer seal start to leak, the internal cartridge pressure will keep the bike in position. The air spring is easy to adjust to any rider weight via a single air valve. No special tools are required; the fork air pump is supplied with the bike. The right fork leg integrates a damping cartridge that tailors to all your damping needs. It can be adjusted to the track conditions and the rider’s preferences with a twist of a dial (compression from the top, rebound from the bottom, 30 clicks each). Right off the dealer floor, this fork (with reworked damping characteristics) is more comfortable and more sensitive than ever. But you can still hammer the hell out of it. REAR SUSPENSION The WP shock absorber has been developed with the entire frame and swingarm architecture in mind, including the linkage and the WP AER 48 front fork. It features machined and black anodized components and is a valuable, high-end product compared to roughcast reservoirs. A new, confidence inspiring setting with improved damping characteristics perfectly matches the front-end setup and its striking WP color scheme lets everyone know you have excellent taste in suspension. TRIPLE CLAMP Top quality, CNC machined triple clamps have been a KTM trademark for years to ensure precise handling. For 2017, the upper triple clamp specifically features a redesign in conjunction with the new fork tubes. The rubber damped handlebar mount has also been reworked and the lower handlebar clamps are now separated, while on the upper side a new bridge-type clamp guarantees more torsional stiffness and can easily be replaced in case it gets twisted due to a crash. In addition, an hour meter is fitted at the upper triple clamp in order to let the rider know it’s time for a service. BRAKES You can’t brake any harder, better, faster or stronger. These high-tech Brembo babies are combined with lightweight wave discs made by Galfer. For 2017, the rear brake features a 10mm longer brake pedal and you get new, less aggressive brake pads all round. FUEL TANK A lightweight polyethylene tank with a capacity of 1.85 gallons. The fuel tank cap has an inside thread, which makes for easy and reliable closure. AIRBOX The airbox design offers maximum protection of the air filter while ensuring maximum airflow. The large twin-air filter is mounted in a stiff cage, which at the same time holds the system in place. This design is so simple you could still pop a fresh one in with a face full of mud. Without tools. In seconds. Momentum is crucial when laying down fast laps on a 125cc. The ability to shift your weight quickly and easily to work in perfect harmony with the motorcycle is key to maximizing flow. KTM has focused extensively on the optimal ergonomics for high-level performance, ensuring a riding position that offers the best control and, with the option of several handlebar positions, can be adjusted to suit every rider and condition. The way a rider interacts with the bodywork, seat, footpegs and handlebars is to balance and control. For this reason, no compromises were made in these important areas and only the best quality products and designs were used. Sitting on the 2019 KTM 125 SX gives the rider a definite sense of control and this is immediately confirmed the moment he hits the track. SEAT All SX models have a newly shaped seat, designed to match the improved ergonomics. The seat cover features newly developed silicone strips that provide better feel and grip for the rider. The seat is conveniently fixed to the bike using one long, lateral screw, making it safe and easy to handle. HANDLEBAR KTM engineers sure know how to handle handlebars. This tapered one, made of high-strength aluminum by NEKEN, is fixed in damped rubber mounts and has two different positions. From 2017 onwards, the lower handlebar clamps are separated, while on the upper side a new bridge-type clamp guarantees more torsional stiffness. It’s also easier to replace the bar in case it gets twisted in a nasty crash. ODI lock-on grips make grip changes easy which does not require any wire or glue to be secured. FOOTPEGS Sophisticated ´No Dirt´ footpegs prevent smudging up the pegs, even when digging in deep ruts. Looking for a higher riding position? Then just mount the footpegs of the 2018 EXC models, which are 6mm higher than the SX versions. 125 cc riders are renowned for riding with the most aggressive body language. Young, determined athletes riding with exuberant style and pushing themselves and their machines to the limit. This critical consideration went into the development of the bodywork of the KTM 125 SX and was factored into the entire 2019 SX range. By using input from KTM factory riders, KTM R&D as well as Kiska Design, the new bodywork of the KTM 125 SX achieves complete harmony between rider and bike. The main goal was to provide the perfect contact points for the rider, allowing him to move as freely as his spirit demands, with the control to match his intentions. The bodywork is full of intelligent design elements, like the I-beam structure on the front and rear fenders, which guarantee maximum stability with the lowest possible weight. The new modern design and graphics portray an impressively fast and aggressive look that sends a clear message to the competition. DECALS New graphics convey the READY TO RACE character of the 2017 SX model line.